Fire and Water is the third studio album released by the English rock group Free. It became the band's breakthrough, achieving widespread commercial success after the band's first two studio albums had faced a more muted response. With the "tremendous" acclaim of Fire and Water at their backs, in the words of AllMusic, Free headlined the 1970 Isle of Wight Festival and "appeared destined for superstardom". Specifically, Fire and Water reached #2 on the U.K. album chart, being listed on it for a total of eighteen weeks. In contrast, neither of the band's prior two studio albums had charted at all. Fire and Water additionally reached #17 on the equivalent U.S. chart. The album spawned the popular single "All Right Now", praised by publications such as AllMusic as a hard rock "smash powered by [Paul] Rodgers' gritty, visceral vocals". The song became a Top 5 rock hit in not just the group's native United Kingdom, but it additionally did well in multiple European countries such as Austria, France, and Germany. The members of Free speak with fellow musician Steve Winwood in Amsterdam in July 1970. The individuals (from left to right) are Winwood, Andy Fraser, Paul Rodgers, Simon Kirke, & Paul Kossoff. 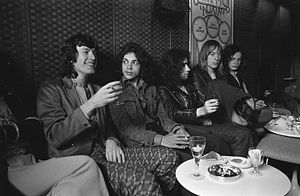 The group had formed in London, England back in 1968, with musician Paul Kossoff of the blues band Black Cat Bones witnessing a project that featured frontman Paul Rodgers. Free came into being once the duo joined up with musicians Simon Kirke and Andy Fraser, the latter formerly from the ranks of John Mayall's Bluesbreakers. Free's debut album, titled Tons of Sobs, came out in 1968 to a muted response. The group's eponymous 1969 follow-up, while expanding on the band's mix of styles, also failed to achieve commercial success. Neither studio album had charted at all. Free recorded Fire and Water from January 1970 to June 1970 in London, the group using the engineering facilities of Island Studios and Trident Studios. Mike Sida devised the album's cover image, with Richard Polak being the band's photographer. Free produced the work themselves, with assistance from others. In addition, Roy Baker contributed to the album's production, providing particular help with the audio engineering. Before getting started with Free, he'd worked with groups such as Savoy Brown and The Deviants in the 1960s. After his association with Fire and Water, he has spent multiple decades serving rock bands such as Byzantium, Hawkwind, Queen, and The Cars. Music critic Matthew Greenwald has written for AllMusic praising the album. He stated that by 1970 "Free presented itself to the world as a complete band, in every sense of the word", particularly with elements ranging from "Paul Kossoff's exquisite and tasteful guitar work to Paul Rodgers' soulful vocals" on display for listeners. He also positively compared the group's work with that of bands Blind Faith, Cream, and Derek and the Dominos. Multiple critics have viewed the album as the high-point of the Free discography. Track "All Right Now" in particular continues to receive widespread radio airplay. All tracks written by Andy Fraser and Paul Rodgers unless otherwise stated. In 2001 the album was reissued with extra tracks, consisting only of alternate versions of songs already on the album. They include an alternate vocal take of "Oh I Wept" and a remix of "Fire and Water" to correct many of the production deficiencies that the original contains. This version of the song does not fade out; instead Simon Kirke's final drum solo is performed to the end resulting in this version being twenty-one seconds longer than the album version. A BBC Session of this song is also included. The extra tracks also include three different versions of "All Right Now": one is a BBC session; one is the edited version that was released as a single. It runs at 4:18, one minute and fourteen seconds less than the album version: the final verse is gone and the guitar solo is heavily cut down, a fact that Kossoff disliked. The final version of the song is an early take that was never used. In 2008 the album was issued again as a 2CD Deluxe Edition with twenty-three extra tracks. Most of these bonus tracks had previously appeared on the Songs of Yesterday box set, but five previously unreleased alternate versions were also included. Wilson Pickett's 1971 version of "Fire and Water" reached #2 on the Billboard R&B charts. Far Corporation covered "Fire and Water" on their first album, Division One, in 1985. XYZ covered the title song on their second album Hungry in 1991. Mr. Big, who took their name from the Free song, covered it on their 1993 album Bump Ahead. Gov't Mule covered "Mr. Big" on their debut album Gov't Mule, released in 1995. The Answer recorded "Fire and Water" on their 2011 release Revival. Singer-songwriter and former Kiss guitarist Ace Frehley performed the title track on his covers album, titled Origins, Vol. 1, which he released in 2016. The track featured past and current Kiss frontman Paul Stanley. Black Stone Cherry's version of the title track appeared on the Classic Rock covermount CD Black Stone Cherry – Hits, Rarities & Live in 2014. "Paul Rodgers is hands-down the greatest rock 'n' roll singer that's ever lived," enthused frontman Chris Robertson. "One of [drummer] John Fred's favourite songs is 'Fire and Water'. And I was like, 'I want to see if I can even sing it!' You gotta be slightly crazy to attempt singing a Paul Rodgers song, but I think we did a cool version. It's acoustic, but still kinda heavy." ^ Daniels, Neil (2013). High Stakes & Dangerous Men: The UFO Story. Soundcheck Books. p. 7. ISBN 978-0957144262. ^ a b c Ankeny, Jason. Free - Biography at AllMusic. Retrieved 7 May 2018. ^ a b c "Free". Official Albums Chart. Retrieved 7 May 2018. ^ a b c Greenwald, Matthew. Free - Fire and Water at AllMusic. Retrieved 8 May 2018. ^ Roy Baker - Credits at AllMusic. Retrieved 12 May 2018. ^ Robertson, Chris (June 2014). "Black Stone Cherry – Hits, Rarities & Live". Classic Rock. p. 44. Sutcliffe, Phil. Notes to Fire and Water by Free. Universal Island Records Ltd. 1970, 2001. This page was last edited on 5 April 2019, at 19:30 (UTC).